Tastings like this one don’t come along every day. Robert Mondavi and Baron Philippe de Rothschild met first in 1970, when Baron Philippe was in the US and, rumour has it, specifically looking for a potential partner in a joint venture. But the good Baron was somewhat distracted at the time, being in the final throes of his long and ultimately successful campaign to have his beloved Château Mouton-Rothschild reclassified from second to first growth status in the Médoc, which he achieved in 1973. In 1978 Robert Mondavi went to Pauillac, and the two men, having gotten to know each other, hammered out the details of their joint venture in two hours – “something that would take a team of lawyers two years,” quips Opus One’s current winemaker, Michael Silacci. The first vintage of Opus One was 1979 (tasted below), and from the outset two winemakers were employed, one from California and one from Bordeaux. The partners were determined that the wine should reflect both parents’ identities, reflecting something of the terroir of Oakville in Napa and Pauillac in Bordeaux, but that the wine should also be something unique. Initially Opus One was shaped by three committees, two that looked after winemaking and viticulture respectively, and a third that looked after aesthetics. Michael Silacci, right, explains that all three played a part in shaping Opus One, with both the practicality and the aesthetics of everything from thevineyard plantings, to the winery and labelling design, to the very character of the wine itself, under constant scrutiny. Michael, who trained at UC Davies and the University of Bordeaux, is Director of Viticulture and Oenolgy: he is overall chief winemaker, though still with two assistant winemakers, one from the US and one from France. 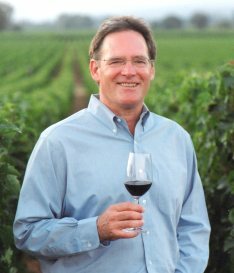 Michael’s background has included stints at Beaulieu Vineyard in Napa, King Estate in Oregon and as winemaker at the famous Stag’s Leap winery in Napa. The wine world has spawned many big-money joint ventures, and all have been with some degree of cynicism. There are those who are deeply resistant to the notion that just because a great European house has joined forces with an ambitious New World estate, the wine they jointly produce should automatically be good, or should command a stratospheric price. Opus One has had its share of doubters too, despite critical acclaim and strong consumer demand. Though Michael (left) makes no comment on that, it is clear that since joining Opus One in 2001 he has seen areas where quality could be improved, particularly in the vineyards. New vineyard teams have been put in place, dedicated to Opus One (previously the same team looked after Mondavi’s vines, situated just across the road). He has also overseen Opus One becoming an estate winery, relying 100% on its own vineyards rather than buying some of its fruit from Mondavi and others. The entire production now comes from four vineyards amounting to around 50 acres. Opus One’s original vineyards were planted under a Bordeaux influence, so much more tightly spaced than would be typical in the Napa region. In the benevolent climate, the vines gave higher yields than might be thought desirable for a wine with Grand Cru ambitions. Michael has been continuing a programme of work to manage this better, and has switched to Guyot pruning since the early 2000s. This is one of the reason a dedicated team was required, and the team spent three days in Mouton-Rothschild in Pauillac “learning to prune Guyot properly,” according to Michael, who videotaped the training for the benefit of his future vineyard workers. Another move was to hire the renowned French soil specialist Xavier Pages, who began to map the soils of Opus One minutely. Xavier’s research led to wholesale changes to all the drainage systems of the Opus One estate in 2002, so they could better control the water to the vines. Michael says this is having a hugely positive impact on his fruit. At the end of 2004 US drinks giant Constellation Brands took over Robert Mondavi. Though many worried what this would mean for Opus One – such a personal passion of the Mondavi family – Michael Silacci seems entirely genuine when he says the effect has been positive: “To a large extent we have become masters of our own destiny for the first time.” This means that Opus One’s management has total control of the company and decision-making (where formerly this was done by a board made up of Mondavi and Rothschild representatives) and even extends to distribution: now neither Constellation nor Rothschild controls the flow of Opus One to the market: all of the wine goes through 18 négociants in Bordeaux, supplied directly by Opus One. Michael feels it is vital that everyone involved in Opus is constantly feeling challenged: “that it’s never same old same old,” he says. To that end he takes his cellar workers and divides them into two teams each vintage, each team supplemented by a couple of Opus One’s corporate staff – managers and accountants. Each team is given a row of vines to make their very own Opus One – around 120 cases – and has to make entirely its own decisions on pruning, picking and winemaking. “All I ask is that they feed back something they have learned into improving Opus One,” says Michael. Making such a change is perhaps one way that Michael Silacci challenges himself, and gives a renewed “edge” and sense of urgency to the whole Opus One operation. There’s seems to be no room for complacency here. The very first vintage of Opus One. It has a beautifully haunting, cedary, alluring nose with notes of bloody, gamy quality and a fine core of rich blackcurrant. The wine is still broad, juicy and mouthfilling, with lovely flesh and terrific juiciness. Lovely length and finesse here, in a very beguiling wine. Great length. This is a rare bottling, “On the endangered species list along with 1991,” according to winemaker Michael Silacci. Drunk from magnum. Still a fairly solid colour, with a hint of over-ripeness and fine, slightly plummy aromatics and tobacco. Not nearly so multi-faceted as the 1979 on initial nosing. Palate confirms this, with a much more strict, structured palate, with fine, dense, slightly less generous quality, but still a lovely solid mid-palate density of fruit and fine balance. Very solid, dark ruby colour, very little browning. Really intense Cabernet-dominated nose, with a touch of vegetal leafiness that is beguiling, and cedar and tobacco notes, as well as a broad base of plum and kirsch like fruit. Striking. Superb in the mouth, with an expansive, lush, mouth-coating quality of ripe fruit. The tannic structure is much more defined, with a chocolaty, supple background, and delightful weight and texture. There are layers of fruit, a crisp cherry acid background, and terrific poise and length. Very dense again, with just a hint of brick on rim. Cedary, herb tinged nose, with pencil shaving notes and subtle spice. Blackcurrant fruit is pure, though the wine not so alluring as the 1991. On the palate this is cool and classy, with a subtle spice and some coffeeish qualities. This seems a more composed and more introverted version of the 1991, without the complexity I have to say, but with a lovely balance and tannin and acid presence into a liquoricy, quite dense finish. Very dark crimson/ruby with a hint of brown. A nose somewhere between the 1987 and 1993, with a hint of plummy over-ripeness, and an elegant cedary quality. Lovely freshness and brightness of fruit on the palate, with really crisp delineation of tight, supple tannins and crisp acidity. This has more of an edge than the 1993, with very good bright fruit, but not the depth or complexity of the best here. A little spice and pepper really warms up the finish, in a stylish wine. This has a savoury, dark, quite tight and muscular nose at present, with a huge depth of cassis and black plum fruit, dusted with spice and little notes of clove and black truffle, but all very tight. On the palate the fruit is very pure and firm. It is gripped by edgy, tight, very supple and polished tannins, but plenty of them. The fruit quality is also very tightly focused and pure, with black fruits and a very composed, polished personality. There is terrific fruit sweetness in this wine, and it has tremendous focus. It is all about potential just now, but a fine Opus One. A much more minty, bright, chocolate and cassis quality here, with the density of sweet, ripe fruit layered in a plush blanket of coffee and cedary oak. On the palate another very dense wine, with the mantle of oak sitting on top of the fruit for now, but the fruit is extremely plush and fine, with terrific sweetness and depth. Lovely layering and lovely structure. Intense, dark purple colour. Strikingly different, with a much gamier, richer, bloody-toned fruit quality. Lovely integrated oak quality, with dark espresso notes. Fine sense of cherry-like, kirschy sweet fruit and minerality. Very dense, mouthfilling palate, with such a concentration of sweet black fruit, all wrapped in a velvety cloak of polished tannin, and dry fruit extract. The acidity is lovely, and this seems to have masses of sweetness and depth. Could be an extremely promising Opus One.